OH MY GOD, LOOK AT THAT GORGEOUS COVER – I CAN’T WAIT FOR 2020! Rainbow Rowell is an amazing author and I really enjoyed her two previous books: Attachments is a delight and Eleanor & Park is amazing and also amazingly tense, because dear god, those kids! Given my own love of fandom, I was particularly delighted to see her publish a book about fanfic writers, or at least a fanfic writer. And I did enjoy this book. The characters are delightful and the plot was interesting. That said, there was just something off about the book and it took me a while to pin down exactly what. The main tension of the story is whether or not Cath (the main character) can deal with the real world or will focus herself exclusively on fandom. This is a real crisis for many college students. However, I found two main problems with the implementation of this plot, one with the timing of the plot arc and the other with the writing style interacting poorly with the tension of the story. The writing style is almost fairy-tale like, with a focus on significant events and turning points without getting into much of the day-to-day activities of the characters. This is a writing style I often enjoy, but when the plot tension is about whether or not the main character is doing her regular day-to-day activities, then it becomes pretty important for those activities to be explicitly addressed. There’s a real question of whether or not Cath is attending her classes, and she says she is, but we only ever see her in one of her classes. In addition, there’s a major plot point about one thing that Cath doesn’t do. But since so much of what she does do isn’t described, there’s no way to tell when she doesn’t do something. That plot point comes out of nowhere when it’s finally revealed. The timing is also problematic. Like most stories, this one is structured with the climax at the end of the book and the end of the time period being described. It certainly makes sense to structure a story like that. But the kind of crisis that Cath is dealing with isn’t one that waits until the end of the year. When I went to college, there were members of my cohort who struggled with online and fandom obsessions. I was only introduced to fandom in college, and started being active in it in my later years, after I had gotten the hang of college itself. From what I saw, though, with others, was that the crisis came early on. They made a choice in their first month of the semester, if they could balance fandom and real world or not. If they couldn’t balance the two, and if they picked fandom, then they flunked out fast. The crisis point doesn’t wait until the end of the year. At most, it might wait until the end of the first semester. So, the end of the book focuses on this crisis of priorities, but I had actually judged the crisis point to have long passed, and I had to play catch-up a bit when the story referenced a turning point that I didn’t even notice. It was a fun book about wonderful characters, but the timing and the tension of it weren’t very well done. I still enjoyed it, but it’s definitely no Eleanor & Park. I just finished Rainbow Rowell’s Attachments, which Kinsey has already reviewed, so I’m just adding on that I LOVED it, and everyone should go read that, too (right after Good Omens). It was seriously one of those books where I was disappointed that it actually ended because I would have been happy to keep reading it for months. Anyway, this is not a post about Attachments, much as I loved it. In order to get some more Rainbow Rowell after finishing the book, I immediately went on twitter and followed her, and she is currently talking about a very interesting new event in the literary world: Amazon is buying the rights to tv shows in order to try to monetize the corresponding fanfic. It is all very new and embryonic, so no one is quite sure how it is going to work, but just that it is certainly going to change things up and it will be quite interesting to see how. Rowell and her followers bring up some very interesting points about what it means to monetize a previously free art form and to normalize a fringe culture (particularly a female-dominated creative outlet into a male-dominated media field). Rebecca has previously given a basic overview into the world of fanfic here, and wants to think over this new development before commenting (she concurs with Rowell’s tweet, that she has many thoughts but few opinions yet on this news). Discussing it with Rebecca, though, it occurred to me that this isn’t quite as much a sudden new development as it is being reported. Rowell brings up that every author after Stan Lee that used the character Spiderman was in essence writing fan fiction. Sherlock Holmes works continue to be published long after Conan Doyle’s death. Publishing houses have already started searching out popular fanfic authors for original works, and have even published fanfic pieces, just with changed names. So we keep moving forward at a fairly steady pace, I guess? Back in October, I wrote a review of Rainbow Rowell’s Attachements, mostly focusing on how sweet and charming I thought it was. Based on that, I assumed that I would like her new novel, Eleanor and Park, as well. I was not prepared for how much I LOVED this book. People, you have all got to go read Eleanor and Park. It’s a love story between two misfits (that’s Eleanor and Park), and for once the misfits actually seem like they don’t fit in. Eleanor is not a nerdy girl who takes her glasses off and then she’s a model–she (and, in his own way, Park) are truly complicated people who struggle to blend in and relate. The portrayal of high school life–with it’s tentative and ever-shifting alliances–is as on-point as I’ve ever read. The point of view alternates between Eleanor and Park, and both of their voices are so distinct and clear–it felt like I got to know two different people. I also love it when a book gives me an insight into teenage boys, and Park is a really stunning character. It made me cry on an airplane, but also made me so happy that I am planning to buy my own copy so I can read it whenever I want. My library classified this as YA and I wouldn’t hesitate to recommend it to teens, but it’s complex enough that I might consider it an adult book. Kinsey’s Three Word Review: Better than words. I’ve mentioned Linda Holmes of NPR and the fabulous Pop Culture Happy Hour podcast here before–both the blog and the podcast are wonderful places to hear intelligent talk about movies, TV, music, other podcasts, and all sorts of other good pop culture-y things. I wouldn’t have said that they talked about books that much, but I’ve gotten a couple of good recommendations from them lately. Gone Girl was something I was probably going to read anyway, and their recommendation just encouraged me, but I would never have found Attachments without Linda’s recommendation on a recent episode, so I am passing it along. 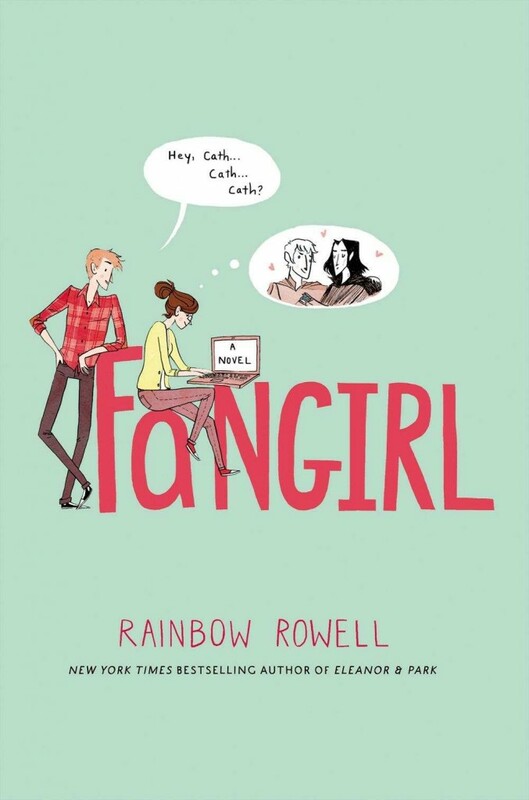 Written by Rainbow Rowell (who has maybe the best author name ever), it’s the story of a guy working in IT at a small-town newspaper during late 1999. His job is to read the employee emails that have been flagged as inappropriate content and issue warnings to the employees, but he finds himself so interested in the emails that two women at the paper are exchanging that he can’t bear to stop them. In fact, he finds himself falling in love with one of them–but can anything ever come of a relationship with such a beginning? Does that make the book sound creepy? It’s not at all, it’s sweet! The main character knows he’s in a potentially creepy situation and spends a lot of the book trying to figure out how to make it less so. And the emails between the two women are fun, and give the book a very epistolary feeling. Plus, all the references to Y2K are sort of charmingly retro. Remember when were so worried about that? Remember when email was so new and fun? I would describe this book as light, but thoughtful–it’s a sweet romance, but the lives of the people involved feel very real and important.